Amazing meat lovers pizza, already made so you don’t have to wait if all you want is a slice. 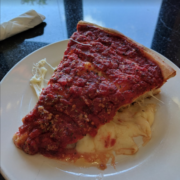 At first the price for one deep dish slice caught me off guard, but it was worth it because it was more filling than I expected. Took a friend from out of town there and she loved it as well! Amazing deep dish pizza! Stuffed crust with veggies and a moist base. Plus they have slices that is best for single person and smaller meals. Small neighborhood takeaway and with a few tables, pizza, salads, subs. The deep dish or “stuffed” is excellent, particularly the spinach and the special. The salads are also surprisingly good. Definitely would recommend. Wife and I were in town for a concert and randomly came across this place while walking around our hotel. It was amazing thick crust. Highly recommend, a place we will seek out again. Best pizza in the whole city! I have been going to The Art of Pizza up on Ashland for about 5 years or so. From the first bite I took of the deep dish sausage, I immediately knew this was a special deep dish pizza. Since then, I have tried Giordano’s, Uno’s, Lou Malnati’s, Gino’s East, and countless other places. None of those places hold a candle to The Art of Pizza. Believe me when I say that The Art of Pizza houses the best deep dish pizza in the city and since Chi-Town is the deep dish mecca, the best deep dish pizza in the world. Do yourself a favor and stop by. On top of that, you don’t have to wait 45 minutes to eat like at the other spots. One recommendation to the manager though as far as the State St. location is concerned. You may want to consider getting a few more staff. Your staff are great! I just noticed when I went in to this location, the line got a bit long and I saw someone walk out because of it. One of Chicago’s most-venerable spots for stuffed pizza, The Art of Pizza, has opened a second location, as they debuted earlier this week in the South Loop. 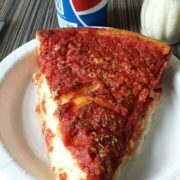 This location offers thin crust, pan, and Chicago-style stuffed pies at 727 S. State St. 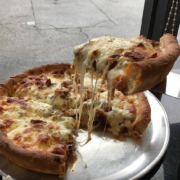 The original location in a West Lakeview strip mall has received numerous awards since opening about 25 years ago and sells pizza by the slice. The South Loop location offers a scaled-back menu. Besides pizza, there’s salads and footlong subs — just like in Lakeview. Items like ribs and fried shrimp aren’t available at the new location. It will also sell slices. 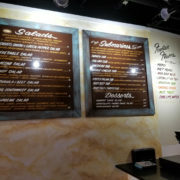 Check out the menu. It’s open a half hour later than the Lakeview location, so night owls have another option. 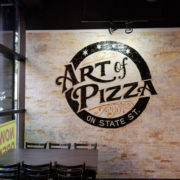 The Art of Pizza, 727 S. State St., (312) 877-5335, open 11 a.m. to 11 p.m. with the dining room closing and last order taken at 10:30 p.m. on Sunday through Thursday; 11 a.m. to midnight with the dining room closing and last order taken at 11:30 p.m. on Friday and Saturday. A North Side pizza institution (and one of our favorites) is now officially open in the South Loop. 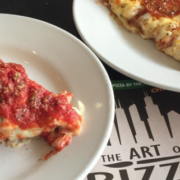 The Art of Pizza opened its second location in the city, at 727 S. State Street, on Monday. The original Lakeview location has become something of a local’s-option alternative to so many tourist-trap deep-dish spots. 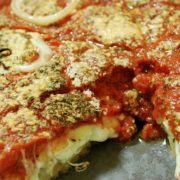 They’ve been crowned Best Deep Dish Pizza in Chicago by more than one publication over their two-decade-plus run. 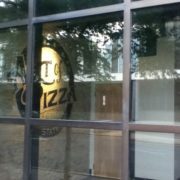 You can also get thin crust and pan, among other non-pizza options, at the new, South Loop outpost. The new location is open Sunday through Thursday from 11 a.m. to 11 p.m., and Friday and Saturday from 11 a.m. to midnight. Hands down best pizza in Chicago!! Hands down best pizza in Chicago!! Get the meaty delight! http://artofpizzaonstate.com/wp-content/uploads/2017/09/art-of-pizza-on-state-interior.01a.jpg 648 864 admin http://artofpizzaonstate.com/wp-content/uploads/2017/08/art-of-pizza-on-state-street-Chicago-white-300x138.png admin2017-09-27 09:53:062017-09-27 09:53:37Hands down best pizza in Chicago!! My husband had heard how great this pizza place was in Chicago. I was up to ride and hungry for some great pizza. I was shocked by how great this place is …seriously! The choices that are ready to eat had me drooling. When I noticed the local cops and city workers that stopped in for lunch – I knew we hit the jackpot. It is very casual so do not get dressed up. You can not be dissatisfied because it is a treasure and I wish it was in Wisconsin. What a wonderful little nearly hole in the wall place. As soon as you walk in you’re treated to a stack of awards and write up ups, not to mention the smell of fresh pies enrobing your nostrils with their beautiful aroma – Like Channel #9 of pizza. The pizza is truly an art form. There is no godly way for that much stuffing to be held against the force of gravity and not showing an inch of sag. I’m pretty sure Yoda is holed up in the back using the force to keep the structure. The we enjoyed the loaded and pep and sausage…. both were loaded across the entire 2.5″ of thickness with really mozzarella slices covering everything in a safety cheese blanket. Don’t eat anywhere else – we waited 45 min in rush hour traffic on the interstate just to get to this place. It’s worth the investment to Art.